The final piece of a £2million jigsaw to create a new home for Richmondshire District Council slotted into place this week. 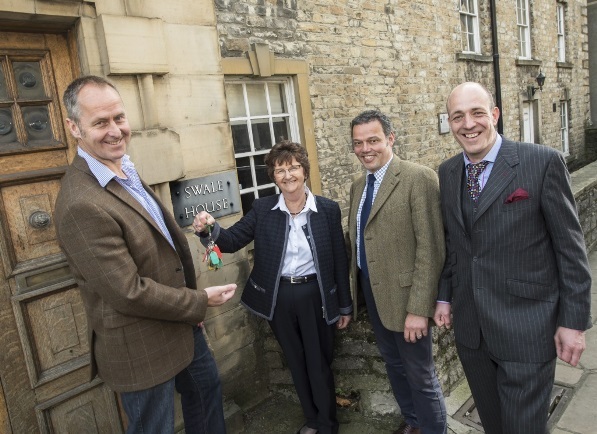 The keys to Swale House in Richmond – one of the council’s former offices – were handed over to their new owners. Richmondshire Developments Ltd, plan to turn the building into two semi-detached homes and seven apartments. Swale House is the last of the council’s buildings to be sold as part of the project to create the new Mercury House headquarters – Frenchgate House and Friars Wynd have already been converted into homes in the town. The creation of the new base also saw the authority move out of Springwell House and the Dundas Street community offices – both of which were leased. “Selling all our properties is an end of an era for Richmondshire District Council – but the start of a new, better one!” said Council Leader Yvonne Peacock. “Not only has most of the cost of moving to Mercury House been funded through these sales, the buildings have gone to local developers who are providing local jobs – a big boost for our economy. She said the council’s move to Mercury House – in the former Lower School on Station Road – brought the council together in one location for the first time in its history. “The £2million move was funded through the sale of the buildings and the reduction in overheads by running just one building, not five. “Our state of the art offices bring everyone together – providing a better service for our customers but also a much better working environment for our officers,” added Coun Peacock.